Sea Spring Seeds is the sister company to Sea Spring Plants. Like Sea Spring Plants it is owned and managed by Michael and Joy Michaud at their nursery in West Dorset. Sea Spring Seeds is an online vegetable seed company selling seeds of reliable, productive and good tasting varieties. In their search for the best, the Michauds run extensive trials at their nursery, where they look at yield, flavour and culinary utility. Sea Spring Seeds specialises in tomatoes and salad crops and promotes ‘Easy Peasy Gardening’ for time-stressed adults, children and anyone without a garden. However, Sea Spring Seeds is best known for its discerning range of chilli seeds that it has on offer, many that are hard-to find or unique varieties produced through an on-going chilli breeding programme. 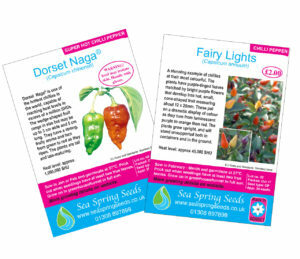 Dorset Naga, one of the hottest chillies in the world, was developed by Sea Spring Seeds. 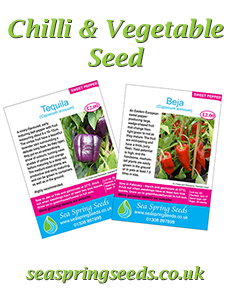 Sea Spring Seeds sells a wide range of chilli seeds. Why grow an ordinary vegetable when you can grow an exceptional one?